At one time this was a very popular style of boat. This boat is a class 4 with the addition of a hardtop coming off the windshield. 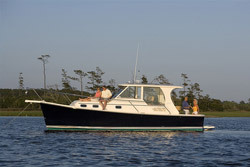 Bayliner Motor yacht club model 3270 and Chris Craft Catalina 310 are good examples. Items that usually indicate a Class 5 is a full salon with a trunk cabin protruding above the forward gunwale. Additional items such as flying bridge, pulpit swim platform and radar arch mounted above the bridge. A half tower may also be mounted over the bridge. *Please note that the pictures and pricing below is a guide as to what your boat cover could cost. Due to the many configurations of most boats in order to get a more accurate cover quote, you will need to email us a picture of your boat so that we can give you a proper price. With bow pulpit, swim platform, extended hardtop and 2 piece cover. Please feel free to contact us directly with any questions you may have about any of our covers. If you are planning on getting a price on a boat cover, its always a good idea to send us a photo of your boat so that we can give you a more accurate price quote.